Here's another great appetizer to serve during Thanksgiving or any time you entertain. I usually don't like to deep-fry foods, but Arancini is great for entertaining because you can make them well in advance, freeze them and fry just before your guests arrive. They also hold up really well at room temperature and do not become soggy. However, I doubt that they will last that long because your guest will gobble them up in no time at all--they are really addicting and delicious! Arancini are usually stuffed with cheese, but I did not add any to mine. If you want to add cheese, Daiya PepperJack would be a good option. Romesco Sauce is a Spanish sauce made with almonds, toasted bread and sherry vinegar. If you don't have time to make the sauce, you can serve these with a Chipotle Aioli, or Roasted Garlic Aioli, which are both really simple to make. Just add adobo sauce, paprika, and lemon juice to your favorite non-dairy mayonnaise and you've got a great tasting dip for your arancini. Crumble saffron threads and add to white wine. Let sit for about 10 minutes to bloom. In a large saute pan, add olive oil and saute onions and garlic until soft. Add arborio rice and cook for about 2 minutes, stirring to coat the kernels. Deglaze with saffron-white wine and cook until wine is reduced. Ladle in two cups of hot vegetable stock and stir frequently until stock is absorbed. Add additional stock by the ladle until rice is completely cooked and all the liquid is absorbed. Unlike when making risotto, you want the rice to be fully cooked (not al dente). Check for salt again and add if necessary. Remove rice from the pan and spread out onto a sheet tray and place in the fridge until cool, about 15 minutes. In a medium size sauce pan, add 1 tbsp olive oil, roasted bell pepper, onion, garlic, diced tomatoes and water. Bring to a boil and reduce to a simmer and cook for about 45 minutes until most liquid is absorbed and vegetables are soft. In a small frying pan, add 1/4 cup olive oil and raw almonds and cook for a couple of minutes until lightly golden brown. Add almonds and olive oil to tomato mixture. Place ingredients into a food processor or blender, along with toasted bread, sherry vinegar and salt and pepper to taste. Blend until smooth, check seasonings and chill ready to use. Set up a breading station: seasoned flour, egg replacer+water and panko bread crumbs. Season each with salt and pepper. Using a small ice cream scooper or a teaspoon, form risotto balls. Working with five at a time, roll in flour, then egg replacer, then panko and place on a sheet tray. This recipe makes about 34 risotto balls. After you finish rolling all the balls, place in the freezer for about 15 minutes to firm up. Using a deep pot and a deep-fry thermometer, heat canola oil to 350 degrees and fry arancini five or six at a time until golden brown. Drain on paper towels and season with salt. 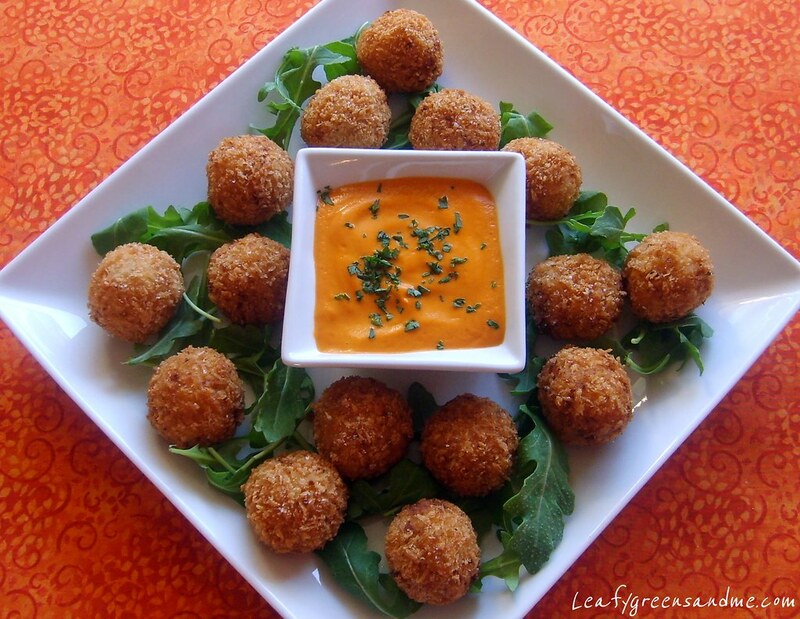 Serve arancini hot with romesco sauce.